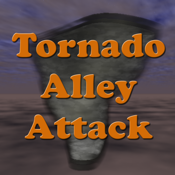 Can you escape the Tornados? You are a Storm Chaser tracking severe weather when things begin to go wrong. You are caught between multiple storm systems headed your way. Objective: Make it safely to back to Weather Command with out hitting too many obstacles or being sucked into a Tornado. Warning: This game is lots of fun! * If you like this app, please write a review and also share this app with your friends and associates on Facebook and Twitter. Thank you for your support. ** We work very hard to make our apps the best they can be and want our users to have a great user experience. If you have ideas on how to make this app better, or If you are experiencing technical problems with this app, please don't write a bad review but instead please contact us by pressing the "App Support" button.